of or pertaining to the esophagus. (ĕ-sof'ă-jē'ăl, ē'-sŏ-faj'ē-ăl), Although this word is correctly pronounced esopha'geal, the pronunciation esophage'al is almost universally heard in the U.S.
/esoph·a·ge·al/ (ĕ-sof″ah-je´al) of or pertaining to the esophagus. (ĕ-sof'ă-jē'ăl) Although this word is more correctly pronounced esopha'geal, the pronunciation esophage'al is almost universally heard in the U.S.
very rare; include atresia, duplication, segmental aplasia, esophagorespiratory fistulae, diverticula, epithelial inclusion cysts. congenital lack of continuity of the esophagus, commonly accompanied by tracheoesophageal fistula, and characterized by accumulations of mucus in the nasopharynx, gagging, vomiting when fed, cyanosis and dyspnea. 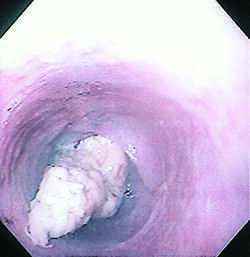 Treatment is by surgical repair by esophageal anastomosis and division of the fistula. may result from acute or chronic obstruction of the esophagus, or from defective innervation. See also megaesophagus. may be tubular and communicate with the effective esophagus, or cystic appearing as a cystic mass close to the functioning esophagus. clinically visible enlargement as seen in esophageal diverticulum, stenosis, paralysis, cardial obstruction. 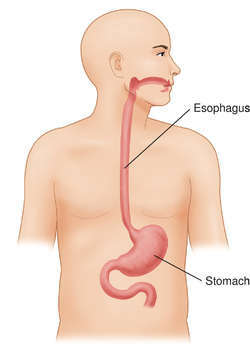 a cause of acquired megaesophagus; usually caused by trauma or spontaneous ulceration. includes granuloma, papilloma, foreign body lodgment; cause of obstructive bloat. hyperkeratotic thickening of the esophageal mucosa due usually to hypovitaminosis A or chlorinated naphthalene poisoning. very rare except for papilloma and fibropapilloma; causes chronic esophageal obstruction. acute obstruction is manifested by inability to swallow, regurgitation of saliva, food and water through the nose and much discomfort expressed by retching movements and pawing at the throat. 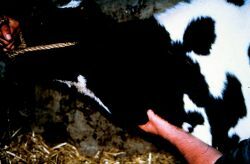 Ruminants develop ruminal tympany. Chronic obstruction shows the same syndrome but with a gradual development and a tendency to develop aspiration pneumonia. occurs in dogs in association with the parasite Spirocerca lupi. a cause of obstructive bloat. causes local cellulitis and compression-obstruction of esophagus. a diverticulum that pushes outwards causing pressure on surrounding organs and tissues. causes esophageal obstruction in neonates. causes esophageal obstruction; may be partial, permitting passage of liquids. usually associated with pressure necrosis due to prolonged obstruction and injury by a solid foreign body or, rarely equine dysautonomia or Gasterophilus spp. infestation. distended veins at the gastric cardia causing dysphagia.